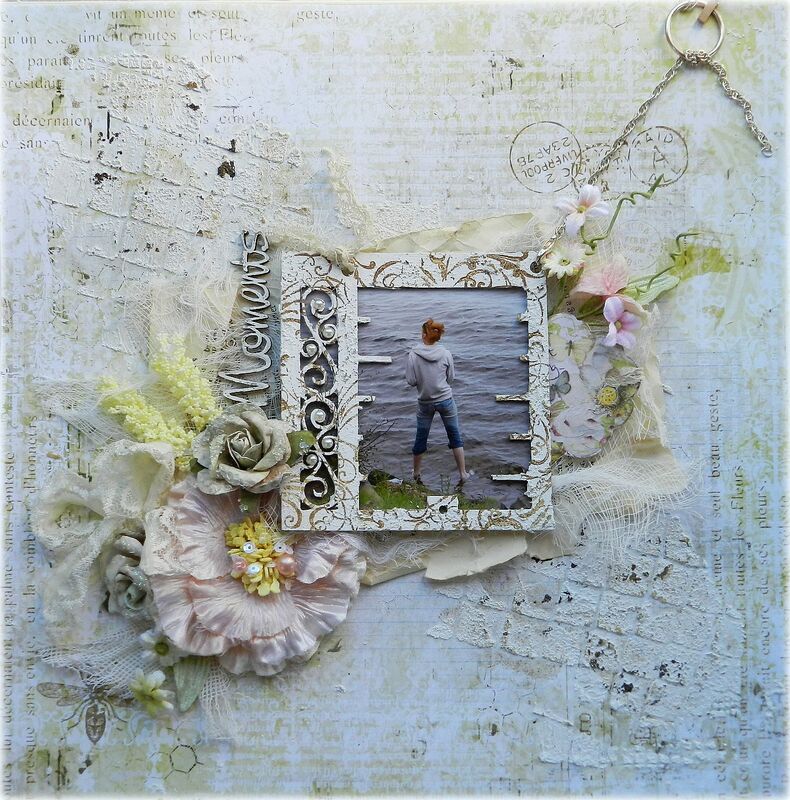 Erin Blegen: My Scrap Cabin: Guest Designer @ Scrap Africa! Good morning everybody :). It's an early one for me today- 5:30 AM...my mom called me this morning all excited because after five long days her beloved cat finally came home after getting out of the house and gone missing. This was a huge relief to her- she's owned this cat for 10 years and is like a child to her. So she was so excited that she had to call me! And I'm the type who- if you wake me up- I'm up. Who doesn't love a delicious flower cluster? 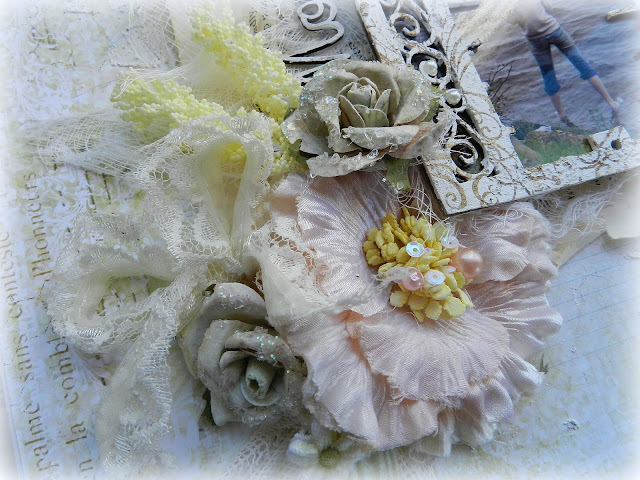 Really loving those yellow Melissa Frances sprigs I picked up in the C'est Magnifique store- they're so delicate and pretty! Gotta say this is my favorite part of my layout. The frame here is actually a part of a gate chipboard set from Scrap FX (Gates A, large scrolls). I cut it down, painted it with gesso and then with texture paste. Then I took a Prima flourish stamp and some ink to stamp the pattern over the top before finally adding some pearls. The "Moments" title is also from Scrap FX. Hidden journaling, as usual! If you're like me, you have a lot to say- and it doesn't always look so great right out there front and center. So I usually stick it on a hidden tag so I don't have to restrict how much I write. For the textured pattern on my background I used the "Fence Frame" template from The Crafter's Workshop along with some texture paste and ink. Thank-you so much to Svetlana and Evgenia for inviting me to guest! And I hope you all take a moment to check out this fab challenge site if you haven't yet! Always great prizes up for grabs and tons of inspiration :). Sooo pretty Erin, I am in love with that frame and the textured background. Just gorgeous! oh, Erin, its so stunning! thank you so much for inspiring our readers! Love what you did with the frame. I like the chain element also. Always love the flowers. Wow! This is just gorgeous! Love the background and the beautiful mix. Perfect take on the sketch! Very pretty!! I love all the different textures you've got going on and the way you altered that chippie, looks so neat!!! Beautiful neutrals, too...Love you! Really interesting use of the gate frame. Love the texture. Totally gorgeous, Erin!! I love the textured background, the stunning cluster with the muslin poking out here & there....and the CB frame with the chain connected. Awesome take on the sketch! So glad to hear that your mum's cat has come home...I can imagine how happy she is :) Have a great day! Erin, love how you give us all the closeups of the details. I like to look at them then scroll back to see how that part fits into the whole picture. The gate is so neat. I think I'm going to start doing more hidden journaling. The story needs to be told, but sometimes I don't necessarily want to tell the whole world! too cool! 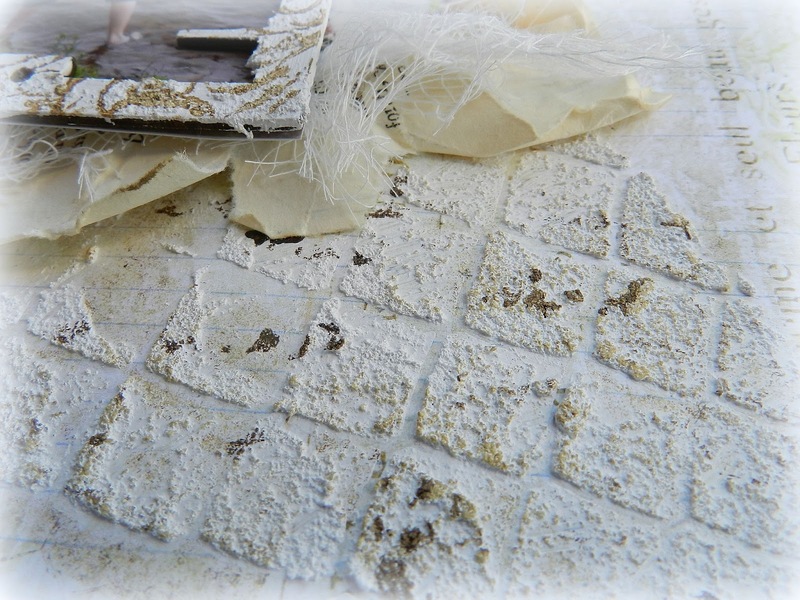 I love that photo and everything you do with gesso. Its really neat. I wouldn't even know how to begin using it! That frame is really neat. Congrats on being a Guest Designer, Erin!! 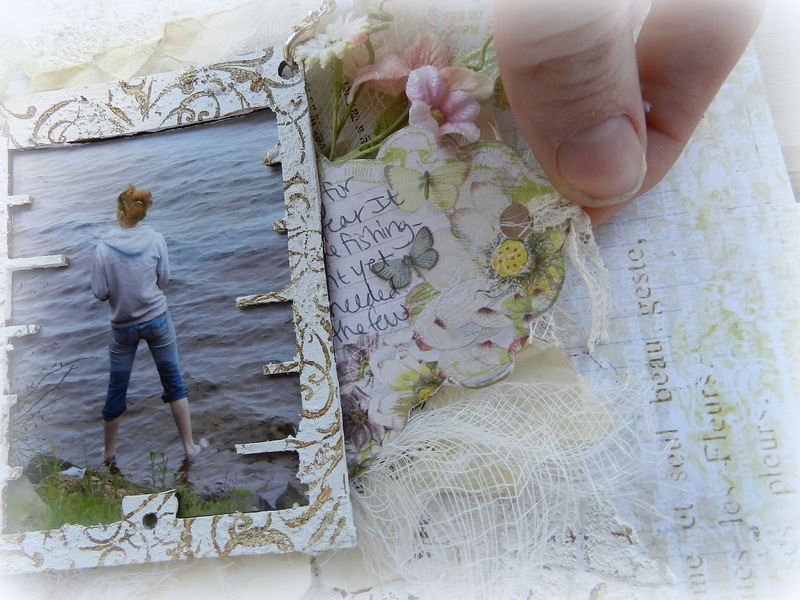 I love that pretty frame around your photo and the texture you create on your background paper is always awesome!! Hi.. oh wow.. this is stunning.. so many gorgeous details.. and all of it I love!! Stunning. The frame hanging like that, the photo, the flowers, masking, texture, should I go on? Love it.